Sale recogiendo cosas en tu granja de los Labradores, en el Alcor. Me salio de una rabano rosa o como se llame. Se consigue plantando la Semilla agorera en la granja, te puede salir de cualquier semilla que plantes. Tiene una habilidad que es muy buena si quieres capturar mascotas, Arremetida debilitadora, que hará que la otra pet quede a 1 de vida (nunca la matará con esa skill ^^). A alguien le ha salido cosechando semillas de cantaflor? Edit: Si, efectivamente si miras en el objeto Semilla agorera, hay un comentario que afirma que puede salir con cantaflor. Hopefully getting this pet won't be as difficult as squeezing blood from it. Terrible Turnip, the archenemy to virmen everywhere! The Sinister Squashling's less famous younger brother. A pet that Wart would be very proud of! The 3D model here is incorrect, I will upload a screenshot from the beta from the pet journal. It actually looks like a mean looking turnip with little arms. I harvested this companion pet from my farm in Halfhill. It grew from an Semilla agorera. LEXX fans may feel a bit twitchy about this pet. Possible reference to the Runescape quest: Evil Turnip? I wish having this pet out made all Vermin run in terror. How rare is this guy? I got him in my 3rd crop and I see the pet selling for ridiculous prices for a blue item. Does not seem to be very rare. If you can handle some fate.. might want to sell your first one while prices are high. Once we have 16 plots to farm, these should be coming faster. This pet has the ability Arremetida debilitadora and is great for capturing wild pets if you find your pet team is accidentally killing wild pets before you can capture them. Players can start their own personal farms at Halfhill in the Valley of the Four Winds. When harvesting fully grown crops, players will have a small chance of looting an Semilla agorera. If planted, the seed will grow and yield the Naba terrible when harvested. This Turnip has the same animations as Lil' Ragnaros. Also, they even share the same level 20 move. Just with different names. Has anyone got a second ominous seed yet? I quickly put mine up on the AH when I looted it since there were none listed, and was selling other blue pets from MoP for 3500g. Now I am sort of regretting it, wondering if you can get a 2nd one on the same character. I really don't want to farm on my alts forever to see it again. Is this a deffinite drop from Ominous Seed? The younger men were gathered at another table, where Pyp had stabbed a turnip with his knife. "The night is dark and full of turnips," he announced in a solemn voice. "Let us all pray for venison, my children, with some onions and a bit of tasty gravy." A mock prayer spoofing the saying of the followers of the Red God R'hllor: "The night is dark and full of terrors"
Maybe not a reference, but I wouldn't put it past Blizzard to have such obscure allusions. My favourite thing about this pet is its level 1 ability, Weakening Blow. It cannot bring an opponent's health below 1. Basically, it means this pet is absolutely AWESOME to use for capturing. I leveled mine up to 25 the second I got it, and used it to easily capture all the lower level pets I'd skipped capturing while leveling. Plus, it's pretty epic looking. As a vegetarian, there's something incredibly satisfying about being able to use an oversized garden vegetable as a battle pet. 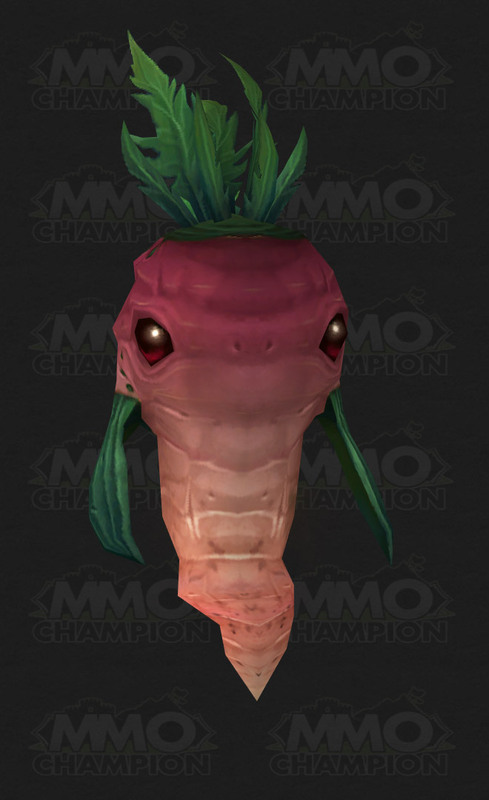 Ahh the terrible turnip, one of the most beloved companions of MoP. The key to getting this pet is to farm as usual. There is a chance you will receive the pet when you harvest one of your crops. He originally comes in the form of and Semilla agorera then plant it in one of your farm plots. Then tomorrow you have a great new companion and future battle pet waiting for you. The are able to be sold inflation of the price of this pet is expected considering how new the expansion is. I know you all want the pet but do not buy it! if you plant everyday and keep up with your farming it will eventually drop. unfortunately ive seen one sell for around 30k gold. They are down to just over 1k gold now on my server. I wish everyone good luck on getting this seed, it took me a month so don't give up easily! Here is the question: the drop chance for Ominous Seed is affected by Herbalism and, consequently, Tauren racial Cultivation, or not? My level 90 Orc (not a Herbalist) with full The Tillers reputation and big farm has yet to see this seed drop. On the other hand, my level 85 Tauren Herbalist, which has just 4 patches of soil has seen this seed drop 3 times in 10 days window. So, this is a dumb question but if Weakening Blow never kills the pet, how does someone level their Terrible Turnip past level 1? I have only got 1 of these so far, I was wondering if he can drop off of special crops such as enigma seed. Yes, you can kill other pets with "Leech Seed" attack and lvl 4 attack. Oh yeah , I like this buddy . Video link . So I planted an ominous seed and got this companion. Since I didn't already have it, I added it to my collection. I come on here and see that its buyout price is almost 7000! I should have sold it! Name it Oddish for best effect. Been playing for a while and been exalted for weeks. However, I still have not gotten this item. While there are some people saying how they kept getting it, well, I think those are the same people that loot a mount from setthek halls in two runs. "Players who have learned the Terrible Turnip pet can now continue to find Ominous Seeds when harvesting Cooking Ingredient crops." Does that mean it's also only dropping from "Cooking Ingredient crops" for people who haven't learned one yet? I can't see why they would make the first turnip drop from any plant, and subsequent ones drop only from cooking ingredient plants...and it would explain why I've not found one yet via my 16 Songbells a day, like many people are doing. This pet is really good for capturing enemies. Casting Sunlight (the weather effect) will increase the max health of the enemy's pet without healing it, which drops its percent health. Weakening Blow cannot kill a target, so you can use this repeatedly to bring the target to 1 health. The catch rate of a pet with only 1 health is EXTREMELY high, so as long as the enemy pet is taking no other damage, it's worth the extra hit to bring it down to one. As a combat pet, however, the Turnip is horrible. Every attack it uses except Weakening Blow has a LONG cooldown (5 turns or more), and they aren't even all that strong. Since you can't finish a target with Weakening Blow, this means you have to save these abilities for the finishing blow, which means you aren't using your extra-strong attacks as often. Furthermore, while it can turn the weather to +healing, because it's an elemental, you don't get the benefits of it on your own heals. The only somewhat effective combat aspect to this pet I've seen about this pet is that it is strong against mechanical pets. If you bring a mechanical pet down to one health then use Sons of the Root, the first wave of turnips will kill the mechanical the first time, and then the 2nd or 3rd round will kill it the second time without your pet taking any further damage. A minor note as well: Weakening Blow does not seem to be affected by the strengths/weaknesses of the attack (i.e. it doesn't actually do more damage to Dragonkin or less to Beast). It is, however, affected by abilities that reduce damage, such as Crouch and shield abilities. Oh yeah , I like this buddy . Video link . Strong pet with special spell Sons of the Root , that is very similar to Sons of the Flame . Plus , this pet is really lovely . Other pet plants : Brazie's Sunflower Seeds , Venus , Ammen Vale Lashling , Sinister Squashling , Teldrassil Sproutling , Jade Tentacle , Withers , Crimson Lasher . What everyone is saying about this guy being the ideal pet-capturing pet is true. Level him as fast as you can! He does have one minor problem though; his "sunlight" ability seems to do as much damage to your own team as it does to the opposition. Very aggrovating. Having said that - he is now a standard part of my pet lineup. I will usually have a "tank" pet and "healer" pet of an appropriate level and then my turnip - just in case the pet I've just picked a fight with turns out to be a "rare" I'd like to capture. Can't wait to get another to send to my wife's toons! I was in a group and someone had this thing out. It just stared at me for the entire run... it was terrible. There's a reason why it's called "terrible," this is probably one of the worst battle pets I've used in this game. The only thing I'd use it for is Arremetida debilitadora to catch pets with. Terrible Turnip is pretty expensive since it's such a rare piece of crop. The perfect name for this pet, can be none other than Vitameatavegamin. Note that the main reason to use this pet is for capturing other pets, the main ability for this being Weakening Blow. i want to mention that Weakening Blow does NOT get affected by pet resistances (i.e. it's not strong against dragons, not weak against beasts) even though the tooltip will imply that it is. However, it is still affected by all forms of damage reductions, such as barriers and shield walls (i.e. Cower, etc.). Aww, this companion looks so sweet. I named mine A Turnip At Law. I can confirm this is purely chance. I decided not to bother farming it as soon as I saw it was a World Drop (this was before I knew you literally farmed it!). I managed to get the ominous seed after my first ever crop. I had to come here and see what it was. I've been playing WoW since 2004 and this is the first "drop" pet I've ever legitimately received on my own (not bought). Maybe my time was up. Anyways, point is: Rep and plot numbers have nothing to do with it. I doubt it helps, but my crop was 2 Carrots, 2 Scallions when I got him. Best place to farm this guy is from org or SW. The Auction house - 20g - 50g. keep planting..i kept planting witchberries, carrots, etc maybe that might help. not sure though. it will definitely drop for you. Can anyone confirm if they have looted 2 of these before, with 1 still in their spell book? I was so disappointed when I saw he was only going for around 125 gold. I got my Terrible Turnip off the Auction House and Immediately saw that he was in fact a pokemon in disguise. 2. Leech Seed = LEECH SEED! 6. Sons of the Root= A badass version of DIG! Terrible Turnip...for the 15 gold I spent you are now my best friend. I just got this yesterday after following advice from someone else. I've been planting mainly seeds that produce ore, herbs, and spirits on and off for a year and nothing. It took me three days on three characters by planting the crop that Jogu recommended planting each day. This is what you need to do to get this guy if you haven't already. Be careful with Weakening Blow when another pet uses Call Lightening. The extra damage CAN result in a KO, rendering the wild pet uncatchable. I got the Ominous Seed for this guy tonight after reaping my crops for the faction rep dailies. Specifically, I was reaping Green Cabbage, and picked this up. After I planted it, the Ominous Seedling nameplate appeared, but the seedling itself is nowhere in sight. Here's hoping it's just a bug that'll have no effect on receiving the turnip. I'll find out and let y'all know when I know. Edited to add: I got the Terrible Turnip without any problems. I'm not sure why it glitched as I described, but when I logged in yesterday to reap my crops, the Ominous Seedling was there, just as I would have expected. The turnip is a tiny fella.